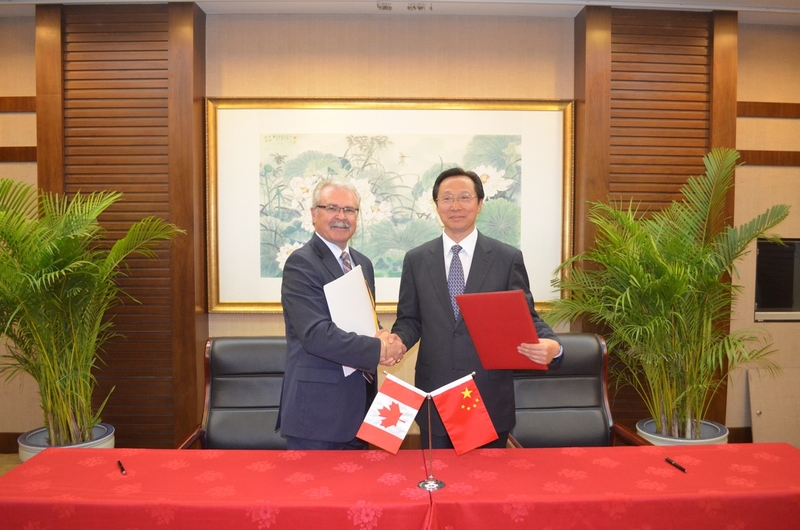 Agriculture Minister Gerry Ritz held key bilateral meetings with the Chinese government that have yielded key developments benefitting a wide range of producers, processors and exporters across Canada's robust agricultural economy. Minister Ritz met with Han Changfu, China's Minister of Agriculture (MOA) and Wei Chuanzhong, China's Vice Minister of General Administration of Quality Supervision, Inspection and Quarantine (AQSIQ). Following these meetings, China formally agreed to work with Canadian officials to provide access for Canadian bone-in beef derived from animals less than thirty months of age as well as access for live cattle. Once access for Under Thirty Month bone-in beef is fully implemented industry estimates the Chinese market for Canadian beef will grow to $240 million annually, while the market for live cattle will total $150 million. During their meeting, Minister Ritz signed two protocols with Vice Minister Wei, one to secure access for timothy hay to China, which industry estimates to be worth $8 million over the next five years, and the other to modernize our countries' live swine protocol, reflecting recent animal health and disease control science-based approaches. Industry expects this protocol will boost Canadian live swine competitiveness in China and result in sales of up to $11 million annually. The meeting also advanced B.C. cherry export interests, through the initialling of a phytosanitary arrangement for a trial shipping period that will lead to permanent access valued by industry at $20 million of fresh cherry exports annually to China. China also agreed to expedite work that will allow for the sale of fresh Canadian blueberries into China. Once fully implemented the Canadian blueberry industry estimates this new access to be valued at up to $65 million annually. Minister Ritz used these bilateral meetings to reinforce the importance of Canada and China's long-term and mutually-beneficial relationship in agriculture, and to obtain commitments to formally establish annual Ministerial-level bilateral meetings. The outcomes of Minister Ritz's meetings resulted in important market access gains for Canadian beef, live cattle, swine, B.C. cherries, blueberries and timothy hay, boosting our producer and processors' ability to compete internationally. Since 2006 agriculture and seafood exports to China have increased more than five fold to total $5.6 billion annually. Top Canadian agriculture exports to the Chinese market include canola, canola oil, soybeans, dried peas, wheat and pork. "The expanded market access we agreed to will ensure our agriculture producers and processors are competitive in the lucrative Chinese market," said Minister Ritz. "By promoting Canada's food and agriculture sector as a reliable and safe supplier of choice for Chinese consumers, we are making sure our agriculture industry will continue to drive the Canadian economy." "Providing the access and the support needed for our Canadian workers and businesses to succeed in global markets is our priority. Just last month, I led a trade mission to China and announced the forthcoming opening of four new trade offices, providing on-the-ground support and increased assistance for Canadian businesses as they explore new opportunities with Canada's second-largest single-nation trading partner. Deepening Canada's trade ties with large and dynamic countries such as China will lead to job creation and opportunities, growth and long-term prosperity here at home." "I want to congratulate the hard work of the federal government in advancing B.C. cherry exports during this important trade mission in China. This new export arrangement provides an incredible opportunity for B.C. cherry growers as we continue to build on already record setting exports of B.C. agrifoods to China." Minister Ritz meets with China's Minister of Agriculture, Han Changfu, during his current mission in China.